Rules regarding medical care in armed conflict have been a cornerstone of international humanitarian law (IHL) since it was first codified in 1864. In contemporary conflicts adherence to these, subsequently refined, rules remains crucial. In this two-part post, I discuss a series of questions about IHL rules governing medical care today. Part I first looks at whether armed forces must have distinct medical services, or, is it sufficient for military personnel to be medically trained so that they can—when necessary—care for the wounded and sick? 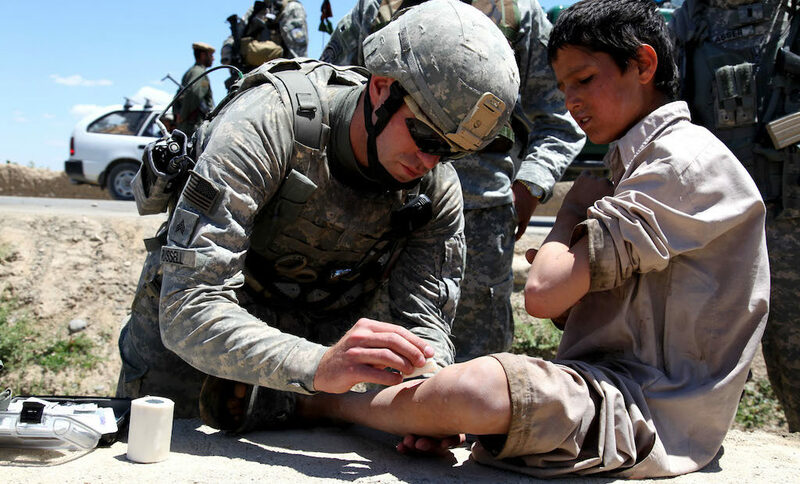 Second, given the number of civilians present in areas of conflict, the question has arisen of whether military medical services must be prepared to collect and care for wounded and sick civilians (as well as their own and enemy wounded and sick). And, if so, under what circumstances. Third, in order for civilian medical personnel to enjoy special protection under IHL, they must be ‘assigned’ by a party to the conflict. When are they considered ‘assigned’? And lastly, medical personnel have the right not to perform acts contrary to medical ethics, but an exception to the rules on medical confidentiality raises concerns. Part II discusses the contours of when medical personnel lose their protection. What acts are considered ‘harmful to the enemy’ such that medical personnel lose their protection? Who may medical personnel defend against what without losing their special protection? And, do medical personnel regain their previous status once they have ceased to commit acts harmful to the enemy? Distinct military medical services and permanent military medical personnel play a crucial role in the scheme foreseen by international humanitarian law (IHL) treaties. Their purpose is to ensure that the wounded and sick are protected, collected and cared for, to whatever nation they belong. In practice, however, States—and even more so armed groups—are increasingly abandoning using a distinct category of medical personnel, as regulated by IHL, in their armed forces. Instead, some of their members are medically trained, but also have combat roles within their armed forces. This practice allows the States and armed groups to have a greater number of medically trained persons within their troops without renouncing the capacity of these members to fight. An additional reason for such a decision is that these parties do not believe that their enemies will respect identified medical personnel. However, in doing so, they forego the protection such personnel benefit from, as well as the probability that their own wounded may be attended to by their own medical personnel even in the midst of the fighting. This leads to the question of whether IHL foresees, or implies, an obligation to have distinct military medical services? Or, is it enough that armed forces have a sufficient number of medically qualified members who, when needed, also have the task to collect and care for the wounded and sick? The answer is unclear. The text of IHL treaties does not oblige a party to have distinct military medical personnel. However, as a detailed regime covers such personnel, it may be claimed that the spirit of IHL requires them to have such personnel, at least when deploying where their civilian medical personnel cannot fulfil the same mission. Independent of the aforementioned question—whether personnel having the distinct IHL status of military medical personnel must exist—a further set of questions arises as to what extent armed forces must be prepared to deliver medical care, to their own members, to their adversaries and to the local civilian population where they are deployed. Under the human right to health, a State has a minimum level of obligations towards its own forces and other persons under its jurisdiction. Moreover, it would violate IHL if it did not provide the same level of care to enemy forces. Any distinction based on grounds other than medical grounds is prohibited by IHL (GCI, Art 12(3); API, Art 10(2); APII, Art 7(2)). Given that Protocols I and II extend the same protections to civilian wounded and sick as are afforded to military wounded and sick (AP I, Art 8(c), AP II, Art 9),one mayargue that this obligation also applies to civilians who are wounded and sick. Certainly this is the case when armed forces encounter a civilian wounded and sick in need of medical care. In their preparations, however, armed forces may take into account that a local health system exists, whose task is to care for the civilian population. Under IHL they have an obligation not to interfere with the functioning of that system. Moreover, at least as occupying powers, they must—if necessary—support the local system and—if necessary—organize themselves such health services (GC IV, Art 55 and Art 56). Nevertheless, in my view, belligerents—other than an occupying power—do not have to prepare for setting up medical services that can take over the health system in every place they are deployed. Nor do they need to have specialists in specific areas of medicine (paediatrics, gerontologists) that their own forces, or their opponent forces, will not need. When belligerents know that they will fight in a place where the local health system cannot be expected to function properly, they only have an obligation to provide the necessary health services (and therefore to prepare in view of this obligation) when they turn into an occupying power. And even then, they have the choice to do this through their own military medical services or through (local) civilian health services that they build up. NGOs and specialized private companies may be asked to assist (and their offers to assist must be accepted if the necessary medical care cannot otherwise be provided). The main responsibility, however, remains with the territorial State and the parties to the conflict. Those parties may—and must—also coordinate the international NGO and IO responses, as long as such coordination does not require violations of medical ethics—e.g., requiring that the organizations give priority to certain beneficiaries or not treat others. Several problems arise out of this ‘law of occupation’ approach. First, when preparing for an operation, armed forces cannot yet know whether there will be an occupation. The very definition of the concept of occupation depends exclusively on the facts on the ground (effective control by the occupying forces and loss of control by the authorities of the occupied country). Does this imply that whenever a possibility for occupation exists, a party to the conflict has to prepare itself for such a likelihood? Second, armed forces may have some obligations of an occupying power as soon as they are present in a given place, according to a flexible understanding of such obligations or a functional understanding of the concept of occupation itself. Other shortcomings to such a construction through the law of military occupation are that it cannot apply when the territorial sovereign consents to the presence of foreign forces, nor would it apply in an armed conflict not of an international character. In the latter case, however, at least the territorial State has the same obligations based upon international human rights law. 3. Who is medical personnel under IHL? It must be stressed that medical personnel categories benefit from the regime foreseen by IHL not simply through their medical training and duties, but only if they were assigned to their task by a party to the conflict (AP I, Art 8(c)). Other individuals not assigned by a party to the conflict—such as ordinary doctors and nurses as well as the staff of medical NGOs—do not benefit from the special regime afforded to medical personnel under IHL. However, they nevertheless remain civilians who may not be attacked (AP I, Art 51(2)). In my view, medical personnel employed in the public health service may be considered as being automatically ‘assigned’ because the public health service is ipso facto part of the public administration of the party to the conflict. In the case of private hospitals or organizations, however, a specific act of the State is needed to satisfy the assignment requirement of medical personnel. The requisite specific act of State will take different forms depending on the domestic legal order. For instance, a State might effectuate the necessary assignment by issuing laws and decrees, setting up registries or signing memoranda of understanding. While the ICRC recommends (p 370) that States adopt legislation clearly defining the respective roles and responsibilities of medical personnel,it is doubtful whether in practice many States implement these measures in peacetime. However, they should because it would be impractical to make the assignments only after a conflict has broken out. When military or civilian medical personnel work under the control of the enemy, they have the right to continue to perform their medical mission and not to perform acts contrary to medical ethics (AP I, Art 16(2); AP II, Art 10(2); CIHL Rule 26).They may not be punished for doing so (AP I, Art 16(1); AP II, Art 10(1); CIHL Rule 26). They also may keep medical information confidential except as required by the law of their party in IACs (AP I, Art 16(3)) or by national law in NIACs (AP II, Art 10(3) and (4)).The latter exception is regrettable because most national legislation requires medical personnel to report gunshot wounds in peacetime. The application of such legislation in a NIAC means that wounded rebel fighters will no longer dare to use the official health system, thus depriving them of care and leading to the establishment of a parallel health system. It also undermines the perception that medical personnel are impartial and subjects them to pressure by both sides that makes the performance of their task more difficult. Read more in PART II of the blog post. International Covenant on Economic, Social and Cultural Rights (1966), Article 12(2)(c) and (d), and UN Economic and Social Council, General Comment No. 14, The Right to the Highest Attainable Standard of Health, UN Doc. E/C.12/2000/4, 11 August 2000. See Marco Sassòli, ‘The Concept and the Beginning of Occupation’, in: Clapham, Gaeta and Sassòli (eds), The 1949 Geneva Conventions, A Commentary, Oxford, OUP, 2015,pp 1411–13. See Michael Bothe, Karl Josef Partsch and Waldemar A. Solf, New Rules for Victims of Armed Conflicts. Commentary on the Two 1977 Protocols Additional to the Geneva Conventions of 1949, The Hague, Martinus Nijhoff, 1982, pp. 105-6. Blogs must be somewhat brief, which precludes detailed analysis. The approach in some areas is here over simplistic. Some comments. Armed Forces have always depended both upon its medical services and on fighters temporarily acting as medics, wearing the protective emblem in miniature when acting in this role but without the protections afforded to military medical personnel (eg those acting in a temporary capacity can be PW). My own unit (before I was there of course) experienced this in the Battle for Arnhem in 1944 when a variety of vehicles and personnel passed though German lines to a British Hospital – the Germans let military medical personnel and marked ambulances return to British lines but detained other personnel and jeeps without any markings. Referring to what medical services should be provided ignores the variety of circumstances in which military actions take place. When would it be unreasonable not to provide any military medical support – when a section (or smaller), platoon, company, battalion, or Brigade is deployed? If not for a section, but yes for a platoon, upon what basis? And then one adds in the time-line and the consequences. Adding too many medics to an assault force in place of fighters may result in a higher casualty rate – indeed as an ex-paratrooper this was frequently a debating point. Fighting in a country with minimal health services poses both IHL and ethical questions. Ethical issues are usually absent from debates as they are not codified under IHL and thus too difficult for most lawyers to grasp. An added difficulty is that increasingly Western nations at least are increasingly providing most to the care which used to be provided in the combat area back in their home nation (or in the case of the USA sometimes in Germany) which means that the capacity to provide a similar quality of care for enemies in the combat area is lacking . So, an interesting Blog but somewhat simplistic as real life is more complicated!